For Breakfast this morning I Scrambled a Couple of Eggs, heated up a couple of Johnsonville Turkey Sausage Links, toasted a couple of slices of Aunt Millie’s Light Whole Grain Bread, and had a cup of Bigelow Decaf Green Tea. Humid, rain showers late, and a high of 88 degrees outside. Plus we have a high Pollen count out so that tells me its a good day to stay in as much as possible. Idid have to go to local Kroger for a few items. Then stopped by McDonald’s to pick up Breakfast for Mom. I’m preparing Crock Pot Ribs for Dinner so I got those on early today. Then it house cleaning today. Dusted and Vacuumed. Then later repotted a couple of Herb Plants I got the other day. 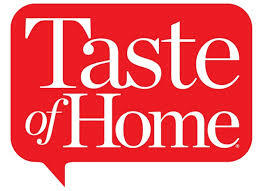 Tonight its Crock Pot Pork Back Ribs w/ Mashed Potatoes, Cut Green Beans, and Texas Toast (Lite). Last night before I went to bed I put half racks in a Hefty Gallon Plastic Bag then seasoned it JB ’s Fat Boy All Purpose Rub and then covered it in JB’s Fat Boy Haug Waush BBQ Sauce to marinate all night in the fridge. Then this morning I got out the Crock Pot, lined it with a Reynold’s Crock Pot Plastic Liner, and sprayed that with Pam Non-Stick Spray and added a 1/4 cup of water. Got the Ribs out of the fridge, discarded the Hefty Bags, and put the racks in the Crock Pot where I let it cook and simmer, on low, for about 7 hours. Long up in the afternoon you can start smelling the aroma of the Ribs, Rib intoxicating! After 7 hours the ribs are ready and now for the hard part of cooking them, getting them out whole without breaking them up! They’re that tender, when eating them you need no knife, the bones just slide out. Tender, moist and just full of flavor! For us JB’s Fat Boy Sauces and Rubs can’t be beat. The Ribs were incredible! Plus I love using that Crock Pot, no mess and with the plastic liner in the Crock Pot little to no clean-up. Just wipe it down and store it for the next time. And as always I would like to send out a big thank who ever invented the Crock Pot Liners! I always use them when using the Crock Pot. For a side dish I prepared some Bob Evan’s Mashed Potatoes. Just microwave for 6 minutes and serve, just as good as homemade, if not better. Next I heated up a can of Del Monte Cut Green Beans. Then I also baked some slices of New York Bakery Lite Texas Toast, It’s fewer calories, carbs, and fat than normal Texas Toast. For Dessert/Snack later a bowl of Skinny Pop – Pop Corn and a Diet Peach Snapple to drink. 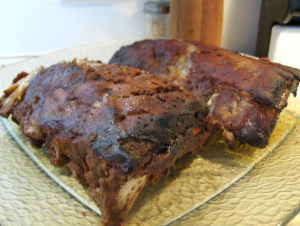 Pork Back Ribs – Pork ribs are a cut of pork popular in North American and Asian cuisines. The ribcage of a domestic pig, meat and bones together, is cut into usable pieces, prepared by smoking, grilling, or baking – usually with a sauce, often barbecue – and then served. Baby back ribs (also back ribs or loin ribs) are taken from the top of the rib cage between the spine and the spare ribs, below the loin muscle. They have meat between the bones and on top of the bones, and are shorter, curved, and sometimes meatier than spare ribs. The rack is shorter at one end, due to the natural tapering of a pig’s rib cage. The shortest bones are typically only about 3 in (7.6 cm) and the longest is usually about 6 in (15 cm), depending on the size of the hog. A pig side has 15 to 16 ribs (depending on the breed), but usually two or three are left on the shoulder when it is separated from the loin. So, a rack of back ribs contains a minimum of eight ribs (some may be trimmed if damaged), but can include up to 13 ribs, depending on how it has been prepared by the butcher. A typical commercial rack has 10–13 bones. If fewer than 10 bones are present, butchers call them “cheater racks”. For Breakfast this morning I made some Simply Potatoes Shredded Hash Browns, Heated up some Meijer Diced Ham, fried an Egg Sunnyside Up, made a cup of Bigelow Decaf Green Tea. I made a bed of the Hashbrowns in a bow and sprinkled some Sargento Reduced Fat Sharp Cheddar Cheese. Next I put the Diced Ham over top the Hash Browns then put the Sunnyside Up Egg on to top it off! One delicious Breakfast! 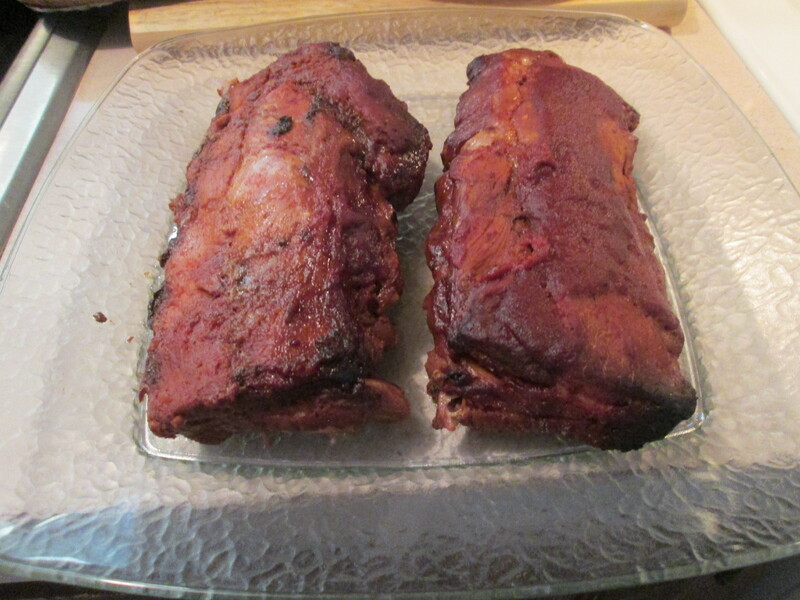 Not long after Breakfast I started to prepare our Dinner tonight – Crock Pot Pork Back Ribs w/ Applewood Smoked Bacon Potato Casserole and Vegetarian Baked Beans. I prepared the Ribs early so we could take a big plate of everything to Dad over at the rehab center. 92 degrees and humid outside today. Did some yard work after Breakfast before it got too hot out there. All caught up with work and cleaning so I took a mid day nap. I haven’t slept good the past few nights, real restless for some reason. So for Dinner tonight its Crock Pot Pork Back Ribs w/ Applewood Smoked Bacon Potato Casserole and Vegetarian Baked Beans. Mom and Dad’s favorite meal is my Crock Pot Pork Back Ribs and they both have been wanting some Ribs. So Ribs it is for dinner tonight. picked up a package at Meijer yesterday, they always have top quality Pork. And these were some Pork Back Ribs, 4 1/2 lbs. worth! Last night before I went to bed I cut the Ribs in half, so they’ll fit in the Crock Pot, and put each half in a Hefty Gallon Plastic Bag then seasoned them with JB’s Fat Boy All Purpose Rub and then covered the Ribs in JB’s Fat Boy Haug Waush BBQ Sauce to marinate all night in the fridge. Then this morning I got out the Crock Pot, lined it with a Reynold’s Crock Pot Plastic Liner, and sprayed that with Pam Non-Stick Spray and added a 1/2 cup of water. Got the Ribs out of the fridge, discarded the Hefty Bags, and put them in the Crock Pot where I let them cook and simmer, on low, for about 7 hours. Long up in the afternoon you can start smelling the aroma of the Ribs, Rib intoxicating! After 7 hours their ready and now for the hard part of cooking them, getting them out whole without breaking them up! Their that tender, when eating them you need no knife, the bones just slide out. Tender, moist and just full of flavor! For us JB’s Fat Boy Sauces and Rubs can’t be beat. The Ribs were incredible! Plus I love using that Crock Pot, no mess and with the plastic liner in the Crock Pot little to no clean-up. Just wipe it down and store it for the next time. I would like to thank who ever invented the Crock Pot Liners! I always use them when using the Crock Pot. For 1 side I prepared Idahoan Applewood Smoked Bacon Homestyle Casserole. I’ve made these a few times now and like the other Idahoan dishes there a breeze to prepare and a delicious Potato Dish. And like he others this turned out fantastic! Very well seasoned, and you can taste that Applewood bacon flavor. Full description and recipe directions are at the end of the post. For another side I prepared some Bush’s Reduced Sodium Vegetarian Baked Beans. I had these sometime back and fell in love with the flavor and taste of the Vegetarian Beans! Only 130 calories, 0 fat, and 24 net carbs per serving. To prepare the; just open the can and empty the Beans Into Saucepan. Heat To Simmer until heated through. Love these Beans! For Dessert later a Weight Watcher’s Cookies and Cream Ice Cream Bar. Preheat oven to 450°F. Combine potatoes and sauce mix in 1 1⁄2-quart baking dish. Stir in 1 1/2 cups boiling water, 1/2 cup milk, and 1 1/2 Tbsp. margarine or butter with whisk. Bake uncovered for 25 minutes or until top is golden brown and potatoes are tender (sauce will thicken slightly when cooling). Remove from oven and let stand a few minutes before serving. Baking Notes: To prepare 2 casseroles at once, double all ingredients, increase baking dish size accordingly, and bake about 30 min. Heat potatoes and sauce mix, 1 1/2 cups hot water, 1/2 cup milk, and 1 1/2 Tbsp. margarine or butter to boil in 2-quart saucepan over high heat, stirring occasionally. Watch carefully to avoid boilover. Reduce heat, then cover and simmer 15 minutes, stirring occasionally, until potatoes are tender and sauce reaches desired consistency (sauce will thicken slightly when cooling). Remove from heat and let stand a few minutes before serving. Had a light Breakfast to start the day. I had a toasted Healthy Life Whole Grain English Muffin topped with Smucker’s Sugar Free Blackberry Jam. Along with the morning cup of Bigelow Decaf Green Tea. After Breakfast I ran Mom to Kroger and on the way home had to stop by the bank and update our credit cards and change the passwords. Back home gave Mom a hand with a couple of loads of laundry. Then did some cleaning of the house. This morning I put our dinner in the Crock Pot. Tonight it’s Mom’s favorite Crock Pot Pork Back Ribs w/ Potatoes Au Gratin and Cut Italian Green Beans. Mom’s favorite meal is my Crock Pot Pork Back Ribs and she’s been wanting some Ribs. So what Mom wants Mom gets! So Ribs it is for dinner tonight. So I picked up a package at Kroger yesterday, they always have top quality Pork. And these were some Pork Back Ribs, 4 1/2 lbs. worth! Last night before I went to bed I cut the Ribs in half, so they’ll fit in the Crock Pot, and put each half in a Hefty Gallon Plastic Bag then seasoned them with Sea Salt and Black Pepper and then covered the Ribs in JB’s Fat Boy Haug Waush BBQ Sauce to marinate all night in the fridge. Then this morning I got out the Crock Pot, lined it with a Reynold’s Crock Pot Plastic Liner, and sprayed that with Pam Non-Stick Spray. Got the Ribs out of the fridge, discarded the Hefty Bags, and put them in the Crock Pot where I let them cook and simmer, on low, for about 8 hours. Long up in the afternoon you can start smelling the aroma of the Ribs, intoxicating! After 8 hours their ready and now for the hard part of cooking them, getting them out whole without breaking them up! Their that tender, when eating them you need no knife, the bones just slide out. Tender, moist and just full of flavor! For all of us JB’s Fat Boy Sauces and Rubs can’t be beat. The Ribs were incredible! Plus I love using that Crock Pot, no mess and with the plastic liner in the Crock Pot little to no clean-up. Just wipe it down and store it for the next time. I would like to thank who ever invented the Crock Pot Liners! I always use them when using the Crock Pot. 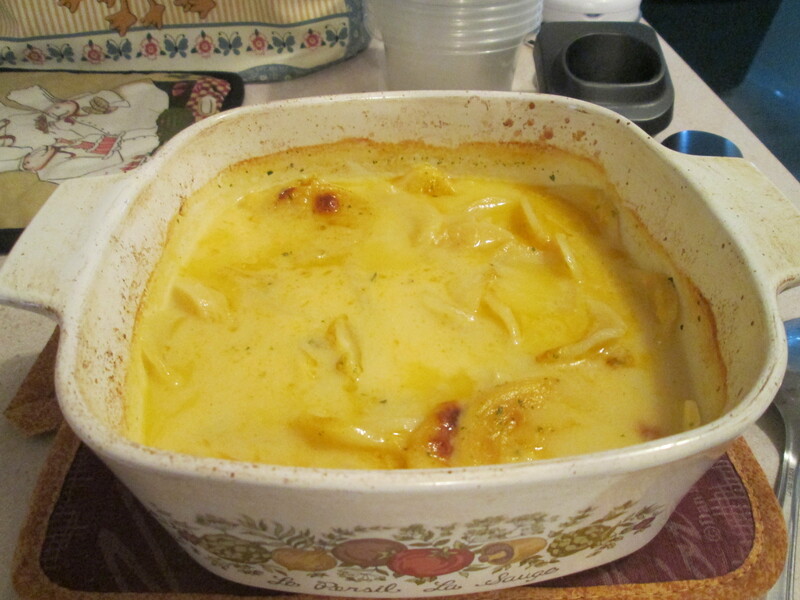 For side dishes I prepared some Idahoan Au Gratin Homestyle Casserole. I left the Idahoan Product info and instructions at the end of the post. Then I heated up a can of Allens Cut Italian Green Beans. For dessert a Healthy Choice Dark Fudge Swirl Frozen Greek Yogurt. Went out early this morning to get the morning paper and a large Doe Deer was coming across the street and going on into woods behind us, beautiful site to start the day! Had a Simple Truth Breakfast Sandwich to start the day, really enjoy these. It wasn’t humid out until the sun finally broke through the clouds and the humidity shot up. A lot of rain again overnight, now we are getting too much rain. There was an article in the paper talking about with all the rain its hampering Yard Care Businesses and local Farms. Usually we don’t seem to get enough rain but not this year. 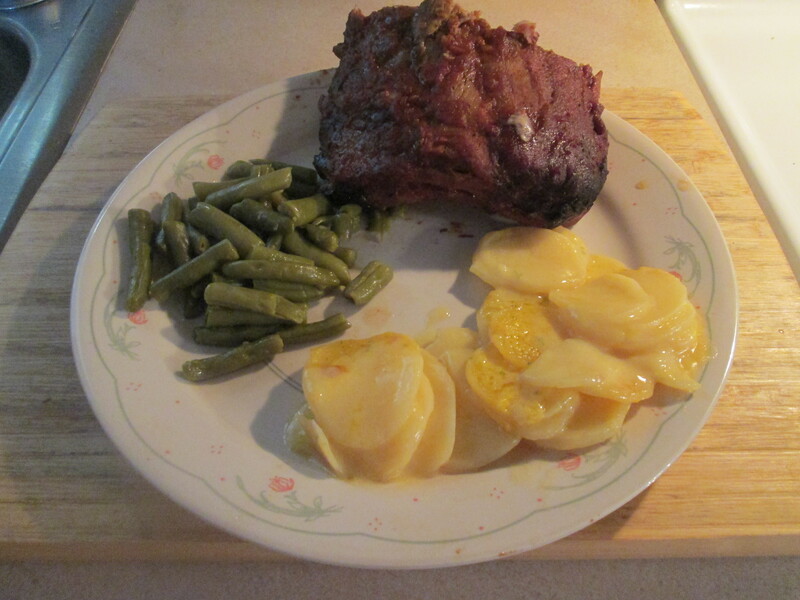 For dinner tonight Crock Pot Pork Back Ribs w/ Potatoes Au Gratin and Green Beans. Mom had been wanting some Ribs so what my Mom wants my Mom gets! So I picked up a package at Kroger yesterday, they always have top quality Pork. And these were some Pork Back Ribs, 4 1/2 lbs. worth! Last night before I went to bed I cut the Ribs in half, so they’ll fit in the Crock Pot, and put each half in a Hefty Gallon Plastic Bag then seasoned them with Sea Salt and Black Pepper and then covered the Ribs in JB’s Fat Boy Haug Waush BBQ Sauce to marinate all night in the fridge. Then this morning I got out the Crock Pot, lined it with a Reynold’s Crock Pot Plastic Liner, and sprayed that with Pam Non-Stick Spray. Got the Ribs out of the fridge, discarded the Hefty Bags, and put them in the Crock Pot where I let them cook and simmer, on low, for about 8 hours. Long up in the afternoon you can start smelling the aroma of the Ribs, intoxicating! After 8 hours their ready and now for the hard part of cooking them, getting them out whole without breaking them up! Their that tender, when eating them you need no knife, the bones just slide out. Tender, moist and just full of flavor! For all of us JB’s Fat Boy Sauces and Rubs can’t be beat. The Ribs were incredible! Plus I love using that Crock Pot, no mess and with the plastic liner in the Crock Pot little to no clean-up. Just wipe it down and store it for the next time. 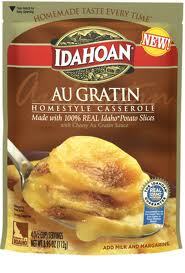 For side dishes I prepared some Idahoan Au Gratin Homestyle Casserole. I left the Idahoan Product info and instructions at the end of the post. Then I heated up a can Del Monte Cut Green Beans. For dessert a Healthy Choice Dark Fudge Swirl Frozen Greek Yogurt. A sunny but coll morning, 40 degrees, to start. But clouds kept rolling in as the day went on. Had a light Breakfast and my morning workout, then off to Meijer. Mom wanted some Beef Cube Steak and Meijer has the best around. Very lean and tender unlike other places where it’s sometimes tough and stringy. Picked up a few other items while there, I wanted some Jennie – O Sweet Italian Turkey Sausages and the Jennie – O Turkey Breakfast Sausage Links but as usual they were out of stock on them. Puzzling why it’s so tough to find Jennie – O Turkey Products around here! Meijer and Walmart are the only ones to carry multiple items and they aren’t very consistent with keeping it in stock. Anyway back home did some housecleaning inside and out. 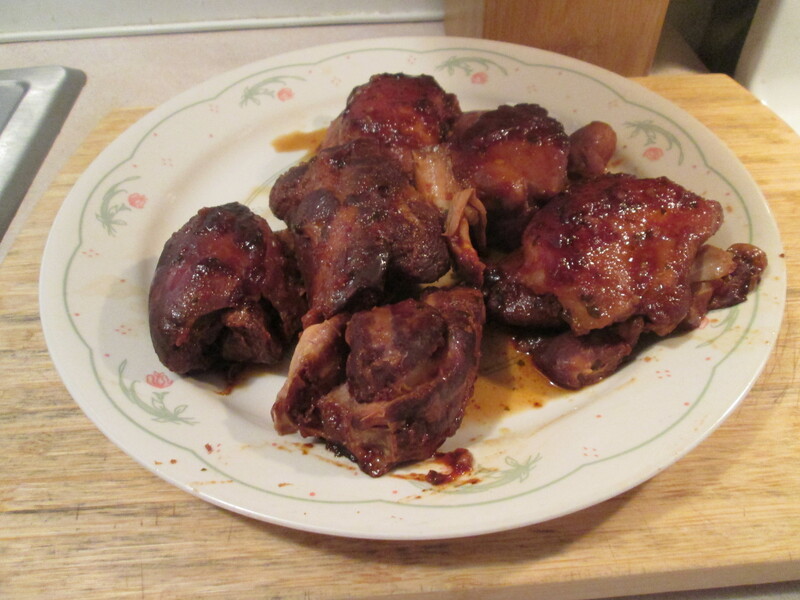 For dinner tonight a new recipe, Honey-Garlic Slow Cooker Chicken Thighs. 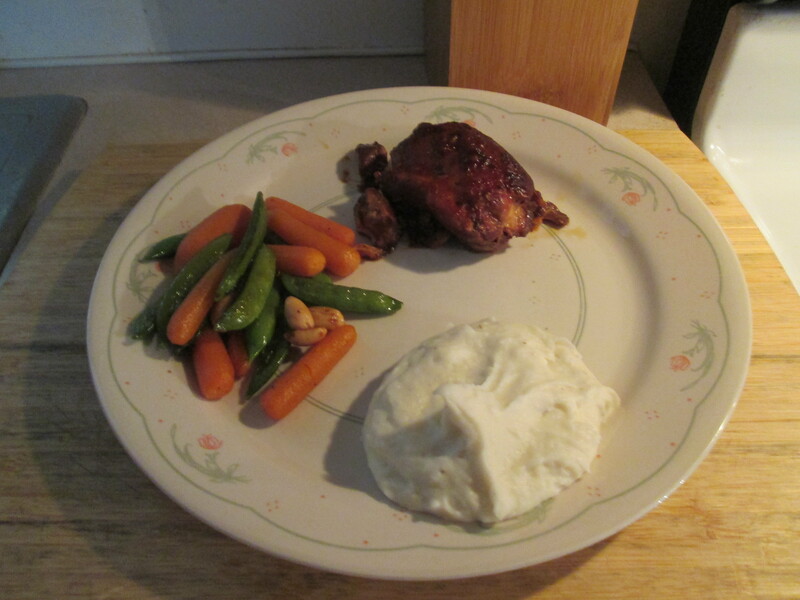 Tonight’s it’s Honey-Garlic Slow Cooker Chicken Thighs w/ Mashed Potatoes, Sugar Snap Peas and Carrots. Came across this in an email from http://allrecipes.com/ and couldn’t wait to try it! So tonight it’s Honey-Garlic Slow Cooker Chicken Thighs. It’s really an easy recipe to make. I’ll need the following; 4 skinless, boneless Chicken Thighs, 1/2 cup Soy Sauce (reduced sodium), 1/2 cup Hunt’s Ketchup, 1/3 cup Honey, 3 cloves Garlic (minced), and 1 teaspoon Dried Basil. To prepare it as I said was very easy! 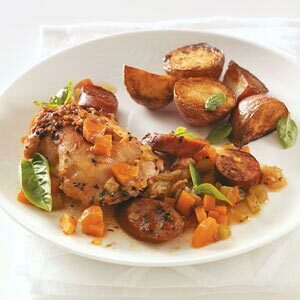 To start Lay Chicken Thighs into the bottom of a 4-quart slow cooker. Whisk Soy Sauce, Ketchup, Honey, Garlic, and Basil together in a bowl; pour over the Chicken. Put the lid on the slow cooker and cook on Low for 6 hours. After 6 hours you have some incredible tasting Chicken Thighs! The combination of all 5 ingredients works perfectly with the Chicken. I especially like that hint of Honey flavor.That “Keeper Recipe” collection just keeps growing with this addition to it! Look no further for that next Chicken Recipe. For one side I made some Bob Evan’s Mashed Potatoes, just microwave for a total of 6 minutes and serve. 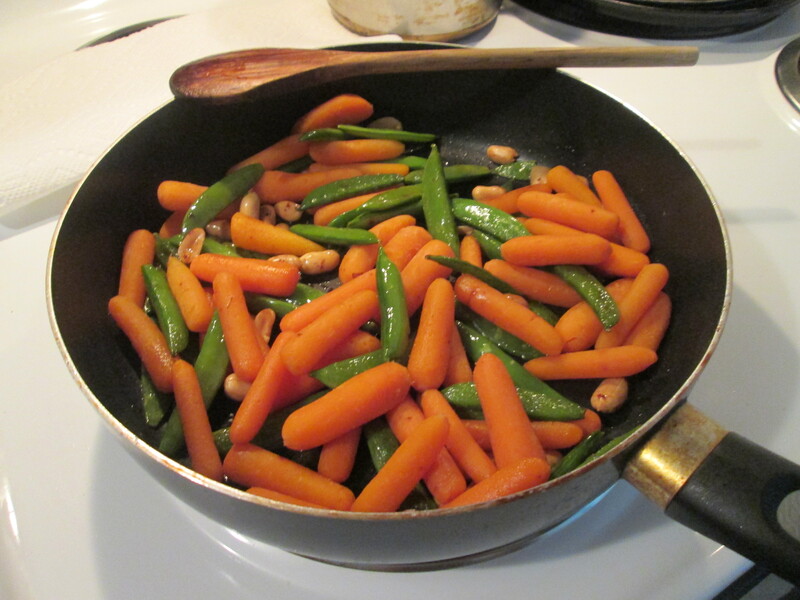 Then I also had some Sugar Snap Peas and Carrots. I buy this from the Kroger Produce Department. The Sugar Snap Peas and Carrots come in sealed plastic tray and all you have to do is prepare it the way you want. I pan fried mine in a tablespoon of Extra Virgin Olive Oil. In a medium size skillet just fry on medium heat until vegetables are fork tender. I also baked Multi Grain Baguette Bread. For dessert later a 100 Calorie Mini Bag of Jolly Time Pop Corn. 1.- Lay chicken thighs into the bottom of a 4-quart slow cooker. 2. – Whisk soy sauce, ketchup, honey, garlic, and basil together in a bowl; pour over the chicken. 3. – Cook on Low for 6 hours. Very cold and windy out today, our streak of good weather is over! Even colder as the week goes on, near 0 by Sunday morning. Today is my Mom’s Birthday! So this morning I made her and Dad French Toast, Sausage Links, and diced up a little Fruit for them. Then for Dinner I told Mom to pick out her favorite Dinner and she chose Crock Pot Ribs. 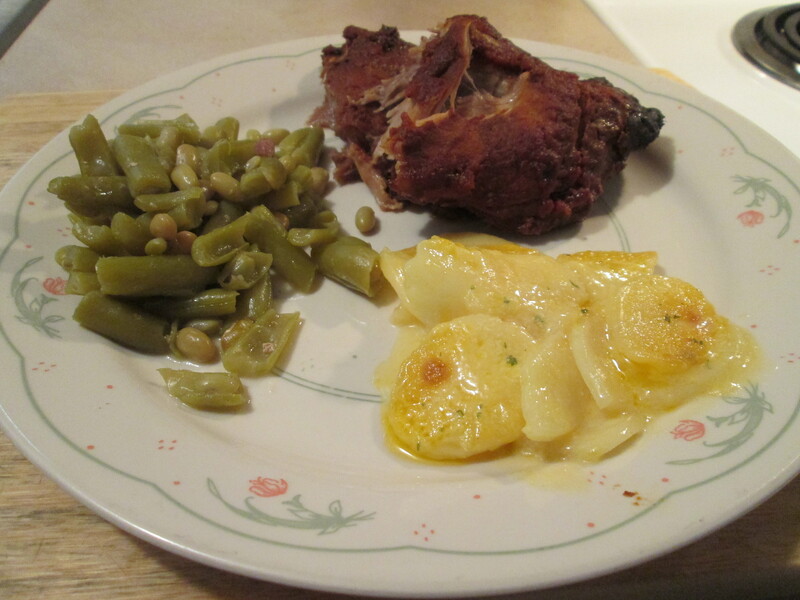 Tonight I prepared Crock Pot Pork Back Ribs w/ Potatoes Au Gratin and Green Beans. Mom had been wanting some Ribs so what better day to have them than on her Birthday! So I pic ked up a package at Kroger yesterday, they always have top quality Pork. Last night before I went to bed I cut the Ribs in half, so they’ll fit in the Crock Pot, and put each half in a Hefty Gallon Plastic Bag then seasoned them with Sea salt and Black Pepper and then covered the Ribs in JB’s Fat Boy Haug Waush BBQ Sauce to marinate all night in the fridge. Then this morning I got out the Crock Pot, lined it with a Reynold’s Crock Pot Plastic Liner, and sprayed that with Pam Non-Stick Spray. Got the Ribs out of the fridge, discarded the Hefty Bags, and put them in the Crock Pot where I let them cook and simmer, on low, for about 8 hours. Long up in the afternoon you can start smelling the aroma of the Ribs, intoxicating! After 8 hours their ready and now for the hard part of cooking them, getting them out whole without breaking them up! Their that tender, when eating them you need no knife, the bones just slide out. Tender, moist and just full of flavor! For all of us JB’s Fat Boy Sauces and Rubs can’t be beat. The Ribs were incredible! Plus I love using that Crock Pot, no mess and with the plastic liner in the Crock Pot no clean-up. Just wipe it down and store it for the next time. For side dishes my Mom prepared some more of the canned fresh Green Beans, or a Mess of Beans as she says, she had purchased from out in Ross at Farmer’s Stand and canned during the Summer. Then I prepared some Idahoan Au Gratin Homestyle Casserole. I left the Idahoan Product info and instructions at the end of the post. For dessert a Healthy Choice Vanilla Bean Frozen Greek Yogurt. Happy Birthday Mom, love you! Our nice weather has left us. It was 36 degrees at 7:00 this morning and by noon it was down to 32 degrees with a wind chill of around 22 degrees. But we still can’t complain, it’s been a somewhat mild Winter in this area. Had a light Breakfast and a quick workout and started getting the prep work done on tonight’s Dinner, and then into the Crock Pot. Love these one Pot Meals! Did some housework and then went to the bank and got some gas, filled it up since the weekend price increase went back down being Monday. 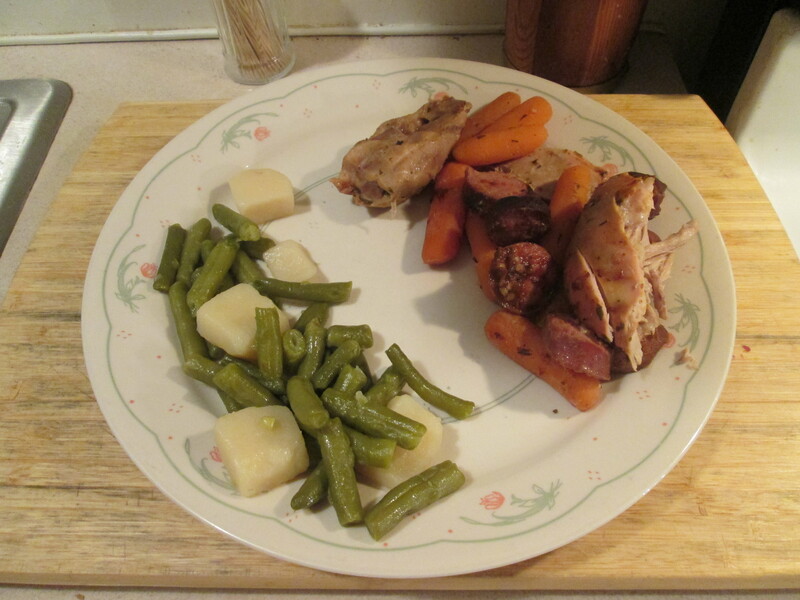 For dinner tonight another new recipe, Chicken Thighs with Sausage w/ Cut Green Beans and New Potatoes. I had come across this recipe in an issue of Taste of Home, love that magazine. It uses Chicken Thighs and Smoked Turkey Sausage, so it’s already a winning recipe! To prep I’ll need the following; 1 Bag Baby Carrots, 2 Celery Ribs (chopped), 1 large Onion (finely chopped), 8 Miller’s Amish Skinless Chicken thighs (about 3 pounds), 1 package (14 ounces) Butterball Hardwood Smoked Turkey Sausage (cut into 1/2-inch slices), 1/4 cup Hunt’s Ketchup, 6 garlic Cloves (minced), 1 tablespoon Frank’s Hot Sauce, 1 teaspoon Dried Basil, 1 teaspoon Paprika, 1 teaspoon Dried Thyme, 1/2 teaspoon Dried Oregano, 1/2 teaspoon Pepper, 1/4 teaspoon Ground Allspice, and 1 teaspoon Worcestershire Sauce. To prepare, it couldn’t be easier! . In a 4 – or 5-qt. slow cooker, combine the carrots, celery and onion. Top with chicken and sausage. Then in a small bowl, combine the ketchup, garlic, hot sauce, seasonings and, if desired, browning sauce. Spoon over meats. Cover and cook on low for 6-8 hours or until chicken is tender. I’ve left the original recipe and it’s web link at the end of the post. After 8 hours of simmering on low I removed the lid to check and see if everything was done, and what an aroma when I removed that lid! 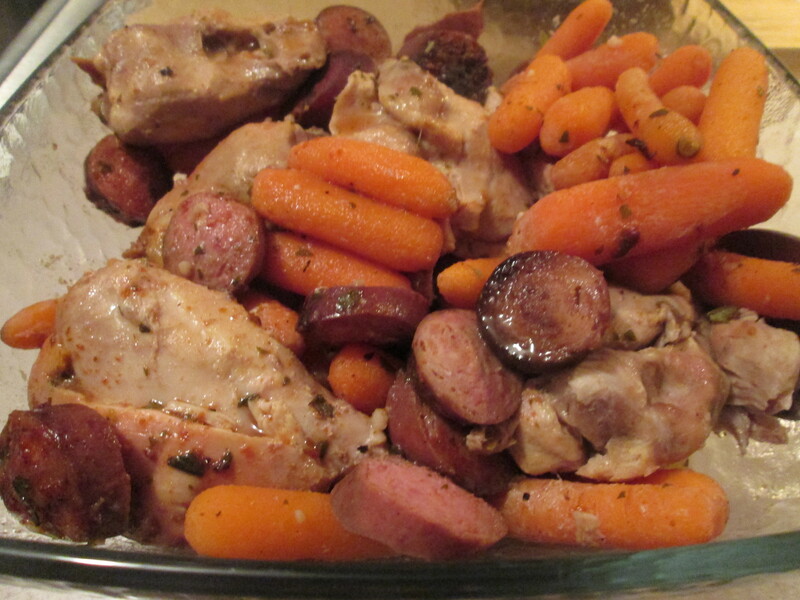 The Carrots were tender and the Chicken Thighs and Smoked Sausage were moist and done just right. The flavor was incredible, we did have to add some Salt but that was it. Very good dish, and a Keeper Recipe. I also heated up a can Del Monte Cut Green Beans and New Potatoes. For dessert later a Jello Sugar Free Dark Chocolate Mousse. 1. In a 4- or 5-qt. slow cooker, combine the carrots, celery and onion. Top with chicken and sausage. 2. In a small bowl, combine the ketchup, garlic, hot sauce, seasonings and, if desired, browning sauce. Spoon over meats. Cover and cook on low for 6-8 hours or until chicken is tender. Yield: 8 servings. 1 chicken thigh with 1/3 cup sausage mixture equals 280 calories, 12 g fat (4 g saturated fat), 118 mg cholesterol, 675 mg sodium, 8 g carbohydrate, 1 g fiber, 33 g protein. Diabetic Exchanges: 5 lean meat, 1/2 starch. Cooking Tip for the Slow Cooker…..
Avoid overcrowding: For the best results, fill a slow cooker between one-half and two-thirds full. Go ahead and cook big roasts and whole chickens; just make sure you use a large crock and that the lid fits snugly on top. Came across this low calorie German Sausage and Kraut dish, Enjoy! 1. Layer Potatoes, Onion, Bell Pepper, and Sauerkrauet in the Crock Pot. Brown Sausage in large skillet over medium high heat. Remove to the Crock Pot using a slotted spoon. 2. Combine Brown Sugar, Garlic Powder, and Black Pepper in a small bowl; stir to combine. Sprinkle evenly over Sausage. Cover and cook on low for 8 hours. 1 serving (1-1/4 cups) equals 282 calories, 11 g fat (4 g saturated fat), 41 mg cholesterol, 550 mg sodium, 34 g carbohydrate, 5 g fiber, 13 g protein.